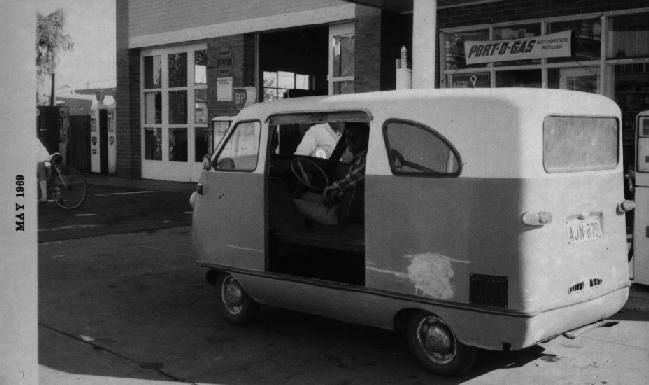 The Goggomobil Carryall was produced in 1960 and is a very unique diminutive van. I have always known it as the Goggo van and will refer to it as such. We bought the van in 1969 with a heap of spares and a sedan. It was garaged for several years and therefore required some work just to get it operational. It was used to drive around several states of Australia by the previous owner who used it for his honeymoon trip. It was set up to have a bed and the additional window was added to the rear to allow a bit of air in the sleeping compartment. We did no body work at all and it is still in its original two tone green and white. It did have slight accident damage to the rear which had been tempoarilly repaired. We used it for several years to carry two Go-Karts that we raced in the 60's and early 70's. The car was not used again after 1971/2 and has been in and out of my posession since then. It has deteriorated as it was not garaged for many years and the floor has rusted very badly. We have always looked at restoring it, but I have several other Renault restoration projects and the van has languished in the back of my garage for the past 10 years. My second son, Martyn used to work on restoration of MG's and decided that he would like to try and get the van back on the road (as long as I paid for it). It has now been out of the garage and restoration has at least commenced. It was a project for the Goggomobil 50th Anniversary in Dingolfing Germany in May 2005, but it definately wont make it. Unfortunately I haven't found a colour photo of it in 1969 as yet, but the set further down show what it looks when we took the body from the chassis. The Van is based on the Sedan chassis with the controls moved forward of the front suspension. The steering utilised a chain drive back to te steering box to retain some backward rake on the steering column. Brake, clutch and accelerator pedal unit is also moved in front of the suspension and the brake cylinder turned 180 degrees and the activation from the bottom extension of the brake pedal. Quite a neat simple modification of the standard Goggo unit. The body is fibreglas and is moulded in two pieces, the bottom section, under the rubber strip, is exactly the same as the Dart. The door on the driver side is steel with a window vent in "perspex" and a glass vertical sliding window activated with a leather belt and "press studs" to set it fully up, or part way down and down, no expenses spared. The passenger side and rear windows are also "perspex" and are fixed. Access to the engine is from inside the van. The fibreglas "rolla-door" on the side sets the van off. Original fuel petroil mix - 20:1 (1 pint of oil to 2.5 gallons of petrol),but with the modern oils I use 30:1 and 25:1 in summer with road temperatures well over 40C. Gearbox is 4 forward and 1 reverse with a two plate wet clutch with a diaphram operation. Suspension is all independant swing axle with coil spring and integral telescopic dampers. Work has started and hope to have it on the road in July 2008 ready for the Australian 50th Year celebrations to be held in August. It is now finished and registered and we have even damaged the engine and replaced the crankshaft after a major failure on the M4. It is almost finished now and just waiting for a couple of items to complete the task. The floor fitted. The rear engine bay cover. The spare tyre and jack storage hatch and well. The body sculptor Jim and the finished job. Marty tying it to the trailer for the trip home. The rear interior. At the spray painter being blocked down after spray putty. The rear view - looking great so far. Commencement of the mechanical assembly. After sealing all of the joints the underbody is sprayed. The completed underbody. The upper chassis is sprayed with stone guard as it is able to be painted bbefore the body is attached. The finished upper chassis. Removing the final external parts. The body temporarily bolted to the chassis prior to fibreglas repairs. Nearing the end of the floor replacement. just adding the seat mounts that are not used in the van. New front secion is in, now to instal the suspension mounting. Welding the mount onto the new front section. Had to remake the section as it was 15mm short. The van had an accident damaged front end as well as the rear. Check it again for alignment and then test fit into the body in the background. Finish off the side rails with the strengthening inserts. It is now straight and stiff with little flex. The master cylinder mounting is welded and just the inner gussets to be installed and the chassis is complete. The chassis parts that are to be replaced. Bought the front floor from OZ and rear from Uwe Staufenberg. Manufactured the rails and front section. Used laser cutter and a bender for accuracy as it is computer driven. Decided on 1.2mm mild steel plate. After sand blasting, there was a lot of rust (and now holes) in the front, so a lot of replacement is being undertaken. Martyn hard at work welding. I just make the cups of tea and supply the tools. The family working hard on getting the chassis and body separated.